HAVE YOU INVITED YOUR BOARD, STAFF, COLLEAGUES AND GRANTEES? At the March meeting, the CCP Board confirmed board leadership through March 2018 and elected three new board members. Continuing in their Board leadership roles are Chair Judith Meyers, president and CEO of the Children's Fund of Connecticut, Vice Chair Michael Johnston, CEO of the Jewish Community Foundation of Greater Hartford; and Secretary Christine Traczyk, executive director of Farmington Bank Community Foundation. CCP Board Member Paul Ballasy, a partner with CohnReznick, is the new board treasurer. Newly elected members to the CCP Board of Directors are: Maryam Elahi, president and CEO of The Community Foundation of Eastern Connecticut; Kelly Giordano, managing director for Newman's Own Foundation; and Judy Rozie-Battle, senior vice president for the Hartford Foundation for Public Giving. At the Annual Meeting & Philanthropy Awards on May 12, CCP will formally recognize three retiring board members for their service: Bob Haggett, executive vice president for Newman's Own Foundation; Linda Kelly, immediate past president of Hartford Foundation for Public Giving; and Guy Rovezzi, CEO of Northwest Connecticut Community Foundation. The Connecticut Council for Philanthropy has signed on to the Community Letter in Support of Nonpartisanship, joining our partners in the state and around the country that have endorsed this important statement. We encourage CCP members, as well as all grantmakers and nonprofit organizations, to sign on and help maintain and preserve the historic commitment to remaining independent of partisan election politics. Follow the link to review the statement and endorse it on behalf of your organization. LOOKING FOR A PROFESSIONAL DEVELOPMENT OPPORTUNITY? All staff with administration, operations and finance responsibilities are welcome to participate in CCP's Foundation Administrator Network. Many Network members justify the meeting time as professional development and are able to bring knowledge, best practices and resources back to their organizations. Register for an upcoming Foundation Administration Network meetings: Thursday, July 13 and Thursday, November 16 at 10:00 am. “Creating Authentic Relationships and Avoiding Power Dynamics with Your Grantees” was the theme of the March 7 Program Officer Network meeting. 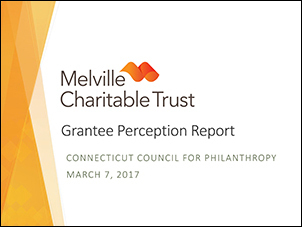 Aimee Hendrigan, vice president of programs for Melville Charitable Trust, shared a presentation on Melville’s Grantee Perception Report prepared by the Center for Effective Philanthropy (CEP). Aimee’s contact information is at the end of her presentation if you’d like to get in touch with her. Program Description: Each grant-making organization has a responsibility to ensure that grant funds are used appropriately and effectively. An applicant and grant recipient must be able to demonstrate their ability to use the funds to support the program strategy, to protect their assets, to effectively account for the use of funds and to provide outcome reporting. This program will discuss the information available on financial statements and tax returns and how that information can help you evaluate applicants and monitor grant recipients. Program Description: Join members of the Connecticut Council for Philanthropy and Exponent Philanthropy for a workshop to explore ideas and best practices on how small funders can make a big impact. In this interactive session, participants will share knowledge and examples of high impact philanthropy with their peers in the Connecticut and New York region. For questions about any of CCP's programs or Network meetings, contact Dee Goodrich, Director of Member Engagement, 860-525-5585. The Aspen Institute Forum for Community Solutions, in partnership with the Ford Foundation, Grantmakers Concerned with Immigrants and Refugees, Funders Collaborative for Youth Organizing and the Hyams Foundation, are organizing this roundtable with the purpose of sharing with philanthropic leaders and other participants models of youth-led organizing and exemplars of authentic youth-adult partnerships in the work for social change. The roundtable will showcase the radical possibilities and power of youth voice, leadership, and organizing, and the role of philanthropy in supporting these efforts. For more information or to RSVP contact Christina Kostuk at Christina.Kostuk@aspeninstitute.org; 202-736-5809. Governor Dannel P. Malloy and First Lady Cathy Malloy are convening a national conference focusing on the human impact of crime and incarceration. The conference will foster conversations about new approaches to juvenile and young adult offenders, pretrial justice, incarceration, and re-entry. Leaders and experts from around the nation will meet with a diverse group of participants, including formerly incarcerated individuals, victims of crime, academics, business leaders, members of faith communities and representatives of labor to discuss progress that has already been made and to examine national and international models of criminal justice reform. The conference will include robust discussions about the collateral consequences of contact with the criminal justice system and will aim to strengthen a growing consensus that states must reimagine justice in order to reduce crime and end the cycle of mass incarceration. For information on sponsorship opportunities, contact Monika Nugent at Monika.Nugent@ct.gov. CCP has curated a list of webinars and local, regional and national events of interest to CCP members. Connecticut Health and Development Institute of Connecticut (CHDI), an affiliate of Children's Fund of Connecticut, has released a new issue brief: Supporting Young Children Who Experience Trauma. The brief discusses the effects of trauma on young children and ways Connecticut can support young children who experience trauma. The Center for Effective Philanthropy (CEP) interviewed leaders of 11 limited life foundations to learn more about their decision to spend down. The result of these interviews is a new report by CEP, A Date Certain: Lessons from Limited Life Foundations. The research illustrates the ways in these foundations approach spending down in nine key areas: why spend down, investing, staffing, grantmaking and strategy, what they owe to their grantees, collaborations, communications, evaluation, and archiving knowledge. The Nonprofit Quarterly's recorded webinar, Why Funding Overhead Is Not the Real Issue: The Case to Cover Full Costs, presents a conceptual review to help nonprofit executives’ understanding of the issue, frame overhead costs and how it relates to funding and mission. "The myths and misinterpretations of the true full costs of delivering vital programs have contributed to a chronically fragile social infrastructure for our communities." The Community Foundation of Eastern Connecticut welcomes Jill Blanchette as its new communications officer. She brings 30 years of experience as a journalist — reporter, designer, manager, technology specialist and trainer — to the position. She also has been a key player in developing social media strategies, creating digital workflow and leading website redesigns. Betty Sugerman Weintraub has been appointed the new Grant Program Manager at the Connecticut Health & Facilities Authority (CHEFA). In her new capacity, she will be responsible for all of CHEFA’s grant programs; including the Non-Profit, Client, and Targeted Grant Programs. Previous to joining CHEFA, she worked for the Liberty Bank Foundation in several capacities, most recently as the Associate Director for Community Initiatives. Her background also includes positions at the United Way and American Red Cross in CT and MA. We join with the Hartford Foundation for Public Giving in mourning the sudden passing last week of Sharon O'Meara, director of community engagement. Sharon was also the chair of CCP's Workforce Affinity Group. Sharon dedicated more than 20 years of service to the Hartford Foundation. In a public announcement, the Hartford Foundation related about Sharon, "She was well-known in the community for her wonderful sense of humor and commitment to her work with nonprofits. Sharon leaves behind a legacy of creativity and innovation in her work as well as the memory of the kindness and caring she exhibited toward all of us. During this extremely difficult time, our thoughts and prayers are with all those were part of Sharon's life." The Member eBrief, is a CCP members-only electronic newsletter. Members receive the monthly publication to keep them current on upcoming CCP programs, member and colleague news, trends, and new resources. Members are encouraged to send press releases, public events, announcements, newsletters and colleague news to Laurie Allen, Director of Communications. 2017 Publication Dates: April 3, May 1, June 5, July, 10, August 7, September 5, October 2, November 6 and December 4. Submission Deadline: Close of business one week before the publication date.